It's heartbreaking what some kids need to do in order to support their schooling. While public education is free, there are still additional expenses incurred for attending classes such as allowance, project fees, and other expenditures. And if you belong to a family that's living below poverty level, you will have to share meager food with the rest of your siblings and parents too. Thus is the case of a kid I read in a Facebook group called Villasis Worldwide Network of which I am a member of. Villasis is a town in Pangasinan. 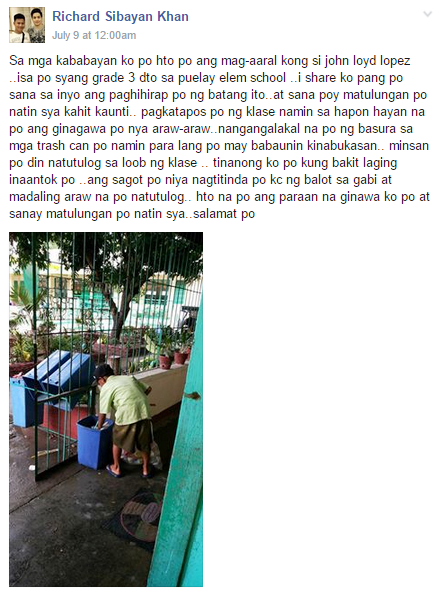 I captured screenshots of the original posts shared by the boy's teacher below. To my fellow citizens, this is my student John Loyd Lopez who is a grade 3 student here at Puelay Elementary School. I would like to share about the hardships of this kid and I hope you can help him even in little ways. After our classes in the afternoon, that's what he does everyday; collecting garbage in our trash cans so he can have an allowance the following day. Sometimes he sleeps in class. I asked him why he is always sleepy. He said he sells balut at night and sleeps at dawn. This is what I thought of doing to help him. I already found the home of this pupil of mine and I further felt more compassion for his situation. I couldn't believe how all seven siblings can fit there. If you can only see, you will know what I'm talking about. I was able to talk with his mother who was cooking a can of sardines with papaya in order to feed all seven kids. For those who are reading this, I hope you can help him. Sorry about my poor translation. I hope I was able to convey the message. 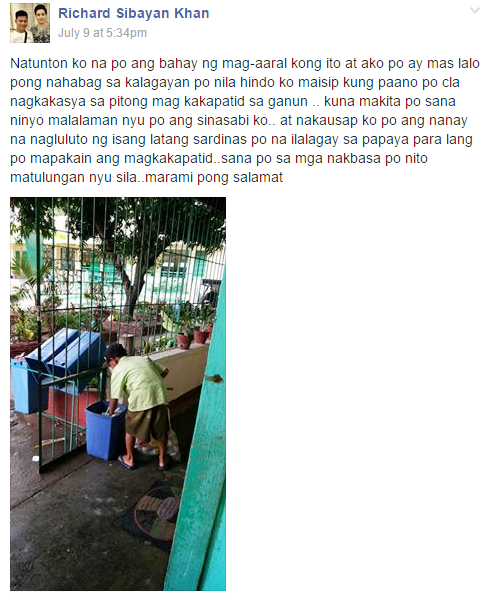 As of this writing, the barangay chairman of the barrio where my roots are from visited the student and donated groceries. You may also do the same or help in any way you can by contacting his teacher directly through Facebook. See Richard Sibayan Khan.